This is how I'll always remember Jon Falk. One hand on the Jug, both eyes on the clock...even though the score was 58-0. Not to fast Jack Miller! Via 2011 Minnesota game. What is Michigan Football without longtime equipment manager Jon Falk? Not nearly the same as it is today, or has been for the last 40 years. To those close to the program, Falk is as much a part of the lore of Michigan Football as Bo or Yost. His smile is as infectious as his stories are. 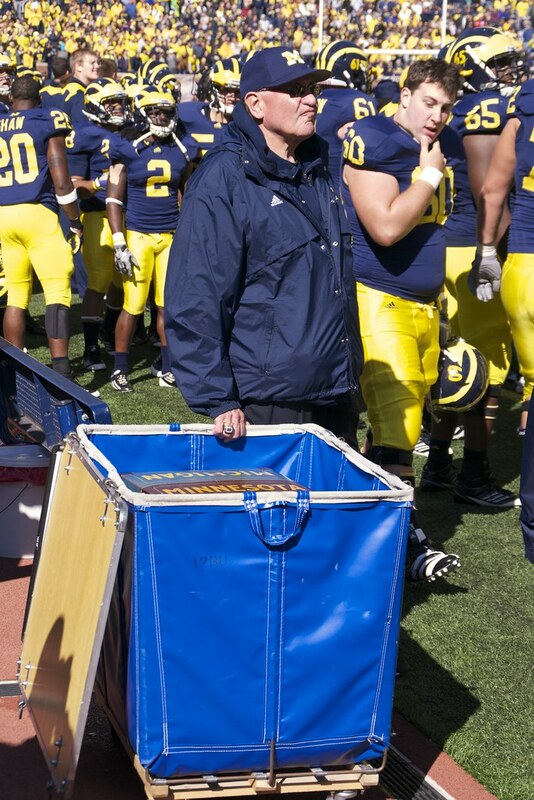 2013 will be the last time Big Jon roams the sidelines and Schembechler Hall as the head equipment man. If you haven't already, go out and pick up his book, If These Walls Could Talk. You won't be disappointed. Official release with lots of former player quotes via MGoBlue below. Nice 8 minute interview with Falk talking about his retirement decision here. ANN ARBOR, Mich. -- Longtime University of Michigan equipment manager Jon Falk announced Monday (July 22) his retirement effective at the conclusion of the 2013 football season. Falk will complete 40 years of service to Michigan Athletics and the U-M football program. "I remember the day that Bo Schembechler interviewed me and said that working at the University of Michigan would present great opportunities for my career," said Falk. "He offered me the position but I decided that staying home to care for my mom and grandmother was more important. My mom woke up at 4 a.m. and came to me with tears in her eyes and said, 'Jon, you are going to Michigan. Bo and the University of Michigan are going to take care of you and this will be a great career move.' As I reflect on my nearly 40 years at Michigan, I have been fortunate to work with some great coaches, administrators and thousands of players. After talking with Dave Brandon about my retirement, I realized that Bo and my mother were right. Dave and Michigan have taken care of me. I'm appreciative of all that I learned, was a part of and contributed to at Michigan. This is a special place and I will always love Michigan and Michigan Football." "Jon has given so much of his life to Michigan Football and we are all grateful to him for his dedication, passion and loyal service to our championship culture," said head coach Brady Hoke. "He is a big part of this program, and his colorful personality will be missed around Schembechler Hall, Michigan Stadium and on the road in opposing venues. We are happy that Jon will be able to enjoy retirement with his wife Cheri and family, but that is on hold until he helps us chase another Big Ten championship this fall." "Jon's four decades of service to Michigan Football and our department is unprecedented and has been matched by only a few former employees," said Dave Brandon, the Donald R. Shepherd Director of Athletics. "His stories are legendary and Jon's passion for his job and the sports equipment industry will be missed by many of those in and around our football program. Jon has been the one constant around our program when all former players, coaches and administrators come back to visit. We wish Jon a wonderful retirement ... but only after he completes his 40th season helping equip our student-athletes and coaches." Falk is responsible for the overall budgeting of the athletic department's equipment needs with apparel providers. He oversees a staff of three full-time assistant equipment managers and a large group of student workers. Falk was honored for his dedication to the athletic department in 1994, receiving an honorary 'M' from the Letterwinners M Club. In addition, the U-M Club of Greater Detroit established the annual Hatch-Falk Scholarship for a Student Football Manager in 2000. Falk authored a book, "If These Walls Could Talk," with longtime Detroit Tigers PR director Dan Ewald in 2010. Falk also made speaking engagements to U-M Alumni groups about his career behind the scenes with Michigan football. A native of Oxford, Ohio, Falk graduated from Talawanda High School (1967) -- where he was inducted into the school's Hall of Fame in 2012 -- and earned his degree in physical education from Miami University (1971). He worked as a student manager at Miami in football and baseball as an undergraduate. After graduation, Falk accepted an assistant equipment manager position at Miami before head coach Bo Schembechler offered Falk his current position at Michigan in 1974. One of the most respected equipment managers in the nation, Falk was executive director of the Athletic Equipment Managers Association (AEMA) for 24 years and was one of the organization's founding members. He earned the association's 2001 Glen Sharp National Equipment Manager of the Year award and received the organization's Lifetime Achievement Award in 2005. Falk and his wife, the former Cheri Boychuck of Ann Arbor, reside in Pinckney. They have three children, Joe Winkle, Nicki Pfefferle and Katie Falk, and two grandchildren, Joey Winkle and Abby Pfefferle. Falk will remain in a consulting role following the season until a successor is determined and transitioned into the position. Jon was an outstanding equipment manager. He was well-organized, extremely well-prepared and on game day he was an advantage for Michigan. What I appreciated most, however, was his presence and his voice in the locker room. His mantra was 'the best (championship) ring is the next one,' and that message resonated with the Michigan teams down through the years. Jon has been a great friend to Ann, myself and the entire Moeller family. I think that Jon was the most knowledgeable equipment manager in the profession. He was the person that his peers across the country would lean on and ask questions of because Jon knew the answer. Jon knew how to handle the job and his responsibilities. You only had to tell him once and it was taken care. Jon was great interacting with all of the coaches and the players on the football team. He cared about everyone that was associated with the program, treated them with professionalism and always helped Michigan football be the best. Jon provided 40 years of great service and will always be remembered as a great Michigan Man. Jon is the last of the Bo era, 40 years is a long time to be associated with something that you love. I know that Bo thought the world of Jon. They worked so well together and were best of friends. No one told a Bo story better than Jon. I'm happy for Jon and I know that Bo was always proud of Jon. Jon and I cried when he told me but I'm happy for Jon and his family ... he will be able to enjoy his retirement. It is virtually impossible for any former Michigan football player from the past 40 years to talk about Michigan football and not have the name 'Big Jonny' pass their lips. He's easily the most important guy at Schembechler Hall that you can talk to today if you want to know about Michigan tradition. One of my favorite things to do when I go back to Ann Arbor is to sit in Big Jon's office and listen to him tell stories ... Bo stories especially. Even though I think he's softened up just a little over the years, he's still a man whose respect you have to earn, no matter who you are ... and he's loyal to a fault. His impact on and contributions to Michigan football will never be forgotten. When Jonny was hired by Bo back in the early '70s from Oxford, Ohio ... he immediately became committed to Michigan. He tells the story about his mother coming into his bedroom, late at night and telling Jon that he should take the job at Michigan because she felt strongly that Bo would take care of him. Jon was not sure he was going to take the job because it meant he would have to leave his mother in Oxford. After she told him it was the right thing for him, tearfully, he took the job and the rest is history. In all the years I've been around Michigan football I'm not sure anyone other than coaches have had more impact on the Michigan football player than Jon Falk. He is a legendary equipment guy. Not only was he great at Michigan, but across the country, his peers in the same capacity looked up to him, and sought him out for advice. Jon loved Michigan football. When he first hired on, I can guarantee there wasn't anything he wouldn't do to make Michigan football better. He protected it like a mother hen. He promoted it like he was the CEO. It was his family, and he made sure he let anyone who came through the doors know it should be just as important to them. Jon is part of the fabric of the Michigan tradition. He traces his roots back to Bo Schembechler. He is as Michigan as the winged helmet. An unforgettable character. A professional who changed the perception of the job. A good friend. Through five football coaches and seven athletic directors, Jon has been as solid as a rock through all the change. He's been in the engine room of Michigan football and he's kept it running without a hitch since the day he arrived. Big Jon has been Michigan football for the past 40 years. He has served four decades of players and coaches at every level. From welcoming every new class of freshmen football players to Michigan to working with Bo (Schembechler), Mo (Gary Moeller), Lloyd (Carr), Rich (Rodriguez) and Brady (Hoke), Big Jon has touched them all. I had the pleasure of being around Jon for five years as a player and three as a young coach. Big Jon was always so much more than just our equipment manager. He was a friendly face who you could always get a straight answer from -- whether it was about football or life. From playing the old Bob Ufer tapes in the locker room Ohio State week, to making sure you kept your locker clean (or you got wet clothes back the next day), Jon was always teaching. He talked to the players about championships and rings (his next one was always his favorite one) and demanded excellence in the locker room. He always had a feel for the team's pulse and knew how to relate to all the different personalities. He had a special relationship with all the quarterbacks over the years and I was lucky enough to be part of that club. My best summer job ever was working for Big Jon the summer I was rehabilitating my knee. I didn't get much work done but I got my master's in Michigan football from being around him. Big Jon has been the one constant who has always welcomed the former players back to Schembechler Hall with open arms and a big smile. It was like you never left. Big Jon has been a legend in the locker room and a great ambassador for Michigan in the college football world. He is a true Michigan Man. Thanks for all the years and sacrifices you gave to our program.